Your Royal Highness, would you do us the honour of naming my ship? 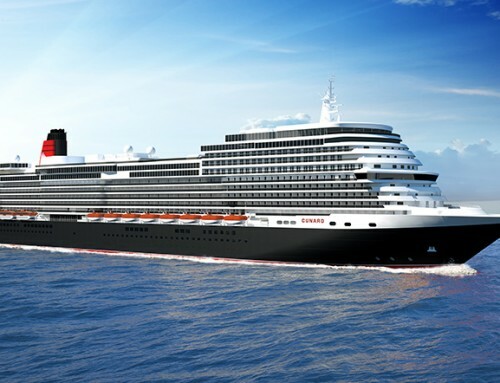 Home/Cruise News/Your Royal Highness, would you do us the honour of naming my ship? It’s a special honour for any woman to name a ship, and Princess Cruises were themselves deeply honoured that Kate Middleton, Duchess of Cambridge, should agree to christen their newest vessel. Kate stepped forward, wearing a striking black and white Dalmatian-print coat, her hat firmly in place despite the near gale-force winds buffeting the Southampton quayside. She accepted a ceremonial pair of scissors presented on a blue cushion by Izzie and Charlie Rowbotham, whose brother was cared for in a children’s hospice supported by the Duchess before he died of cancer at the age of 21 months. Then she climbed six steps to a platform to utter the words; “I name this ship Royal Princess. May God bless her and all who sail in her,” before cutting a blue rope tethering a 15-litre Nebuchadnezzar of Moët & Chandon Champagne. 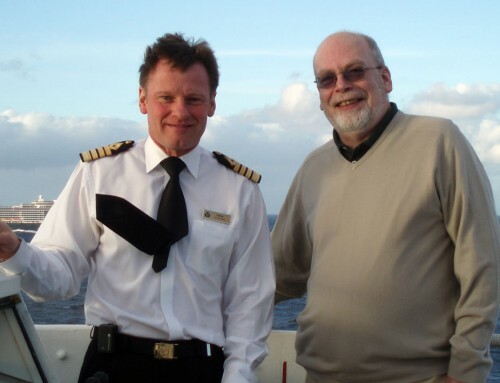 The £1,250 bottle smashed into the ship’s side and burst as if it had been shot from a cannon. Confetti exploded into the air over the heads of guests – including Sir Bruce Forsyth, Christopher Biggins and Liz McClarnon – huddled in a temporary grandstand; West End singer Kerry Ellis launched into the National Anthem, with her microphone not working, and Kate was whisked away for a quick tour of the ship. She told members of crew, lined up to greet her in the gold and marble central Piazza, that it was her first visit to a cruise ship. 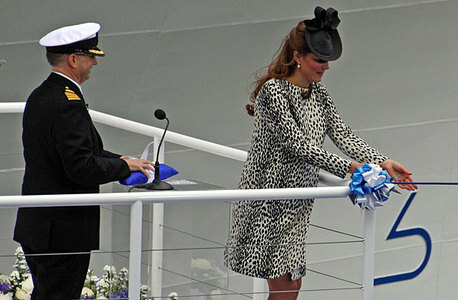 Earlier in the day, Princess Cruises UK director Paul Ludlow spoke of the company’s pride at having Kate on board. “Of all the people who could be considered as potential godmothers, she must be at the very top of the list,” he said. And introducing her on stage, company president Alan Buckelew made reference to the American line’s links to the heritage of Britain’s P&O before saying: “To welcome Royal Princess into our fleet, we are incredibly honoured that Her Royal Highness will officially name the ship today, marking the start of its many journeys through the world’s oceans and to fascinating shores. “The naming of a ship is a tradition thousands of years old. The ritual marks the birth of a vessel, and asks for a blessing of good fortune and safety for the ship, its crew, and passengers. “Perhaps the most important element of the naming tradition is the godmother selected to christen a ship. A godmother is the figurative patron of the ship through its entire life, and symbolises the spirit of the vessel. Kate flew from London by helicopter for her final solo public engagement before taking maternity leave. She is expected to join other members of the Royal Family at Trooping the Colour in London on Saturday, and her first baby is due on July 13. Princess Diana named an earlier ship called Royal Princess in 1984. And in October 2010 Her Majesty The Queen christened Cunard’s Queen Elizabeth at exactly same spot – within yards of the quay from where Titanic departed on her ill-fated maiden voyage in 1912. Watch the video of the naming ceremony here, and check out more information on Royal Princess and details of the ship’s maiden season cruises.